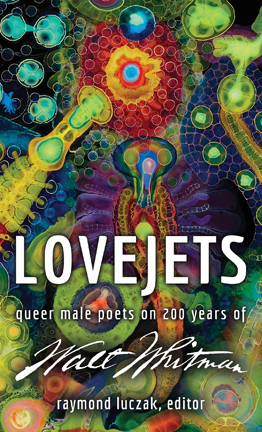 Lovejets: Queer Male Poets on 200 Years of Walt Whitman. Publication date: May 15, 2019. Available directly from Squares & Rebels! Where the heck have you been, Walt Whitman? Walt Whitman, author of Leaves of Grass, was born in 1819. The Stonewall riots happened 150 years later. On the bicentennial of Whitmans birth and the 50th anniversary of Stonewall, over 80 poets pay homage to not only Walt Whitman, but also to queer poets and queer poetry and the vast and various events, revolutions public and private, that have shaken our world since 1819: who we are, where we are, where we have been, and where we might be going in the 21st century.